Dont miss your next opportunity to rise !!! What is your Motivation and Goal to rise ? How to plan (mentally, emotionally and physically) and achieve your goal? Do you often find yourself pondering over questions like these? Do you feel you may have missed opportunities in your life, simply because you didn't recognize them ? Or weren't well prepared to grab them? 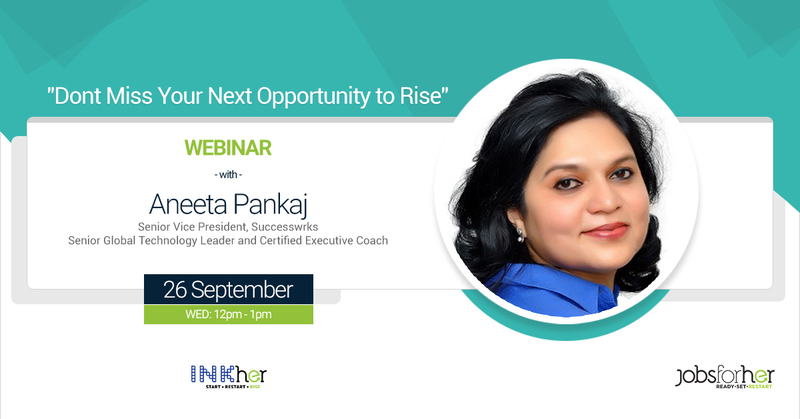 Find answers to such questions and discuss many other relevant issues with Aneeta Pankaj, a Certified Executive Coach in our webinar entitled "Dont miss your next opportunity to rise!!!" Aneeta Pankaj is a Senior Global Technology leader with over 25 years of experience specializing in a variety of Digital and IT functions with a strong technological and creative base. She consults with global PE firms with interests in investments in media & technology in various geographies from APAC to the Middle East. She is currently leading Business Transformation consulting as Senior Vice President, Successwrks, Mumbai. For Aneeta seeing talented women professionals rise and mentoring and supporting them through their individual journeysis a personal passion. She is an avid champion of diversity and is currently penning a book on Gender Diversity.